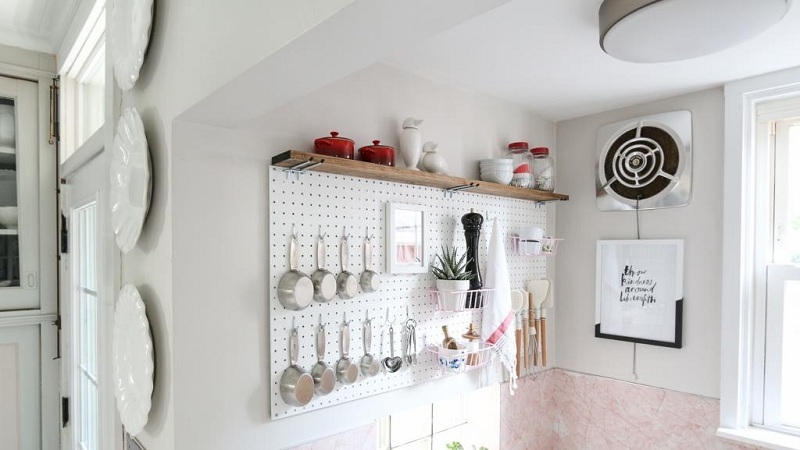 Even in a small kitchen, where free space usually tends to zero, there is often an empty wall left, which is completely unoccupied. This happens because it is almost impossible to furnish the entire room with kitchen cabinets, shelves, and shelves, and it is not rational. 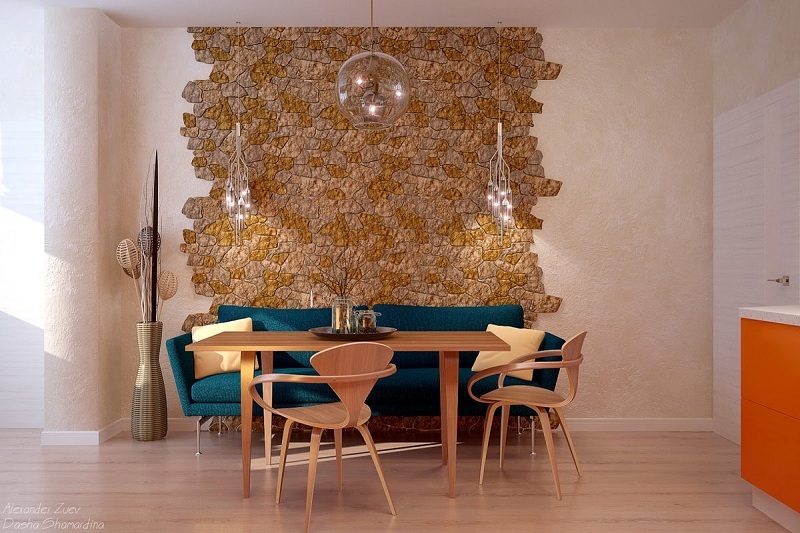 Typically, designers leave at least a small corner for the dining area, and the wall around it is traditionally empty. Otherwise, the desk will impede access to the lockers. The only exceptions are rooms with a bar counter under the window, and here the main decoration is the view from the window or the design of the window opening. What can decorate the notorious empty wall, especially noticeable in close proximity to kitchen cabinets and shop windows? Ways to design one of the walls of the kitchen, there are many, including the techniques of professional designers and decor, created with his own hands. However, before you choose one or another option or come up with an exclusive way to beat the empty wall in the dining area, we recall that special requirements are imposed on the kitchen decor and decoration. Finishing materials, decor items in the kitchen should be moisture-proof, heat-resistant, and easy to wash.
A matching style is one of the key points. The color should be in harmony with the general range of the room, furniture, and lighting. In total there should be a measure, large objects, drawings, massive décor are inappropriate in a small kitchen, bright and dark shades are permissible only as an accent. Trim in contrasting color or material. Of course, with a clock, you can hardly fill the wall entirely, but the secret lies not in size, but in design. There are hundreds of varieties of wall clocks of various types, styles, sizes, and with some skills and materials at hand, it is not difficult to make an original dial with your own hands. Arrows and gear can be purchased separately. 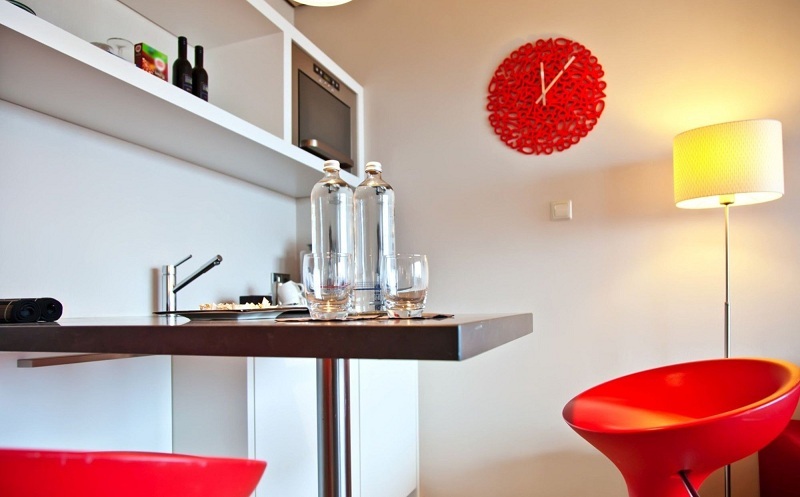 For example, in a high-tech kitchen or minimalism, a wall clock without numbers (like in the photo) will take root, with large chrome or neon hands attached directly to the wall. For the kitchen in the style of Provence or Chebbi chic, choose wooden round dials with painted floral decoupage. The dial of the spoons and forks, with compartments with cereals, grains, painted plates, old records – the options are just the sea. In the end, the clock can simply be painted on the wall! Selecting the shelf, which you plan to occupy part of the empty wall, focus on the overall style of the room and furniture. You can choose beautiful wooden, forged, transparent glass shelves or narrow decorative models that are suitable for a collection of plates, paintings or spices. 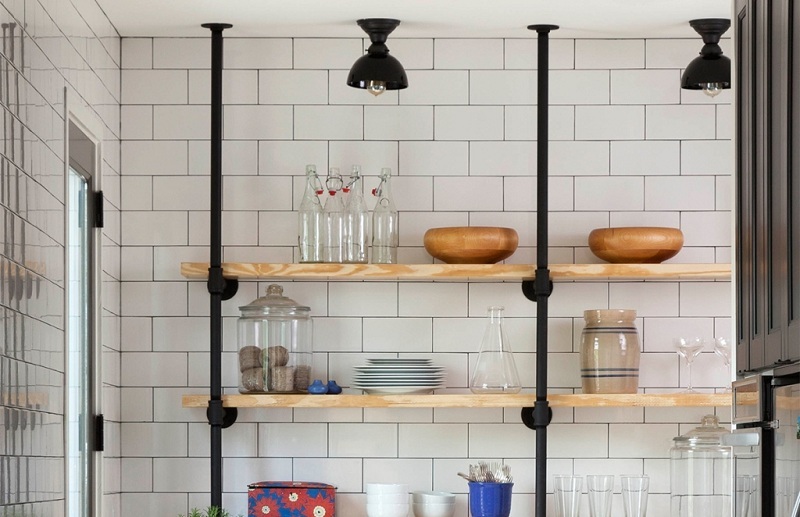 Shelves in the kitchen can be not only decor but also a practical component of the interior. It is convenient to store seasonings; jars of tea, commonly used cups, teapots or just beautiful dishes over the dining table: Turks, glasses, clay pots, coffee grinders, souvenirs. There are special shelf-holders for wine bottles, spices. A tale on an empty wall in the kitchen painted porcelain plates, wooden boards or Zhostovo trays – one of the most common solutions. The main thing is that the style of decorative objects fit the overall design of the kitchen. For example, painted plates and boards will perfectly fit into the interior in a rustic style, country, Provence, clay-colored plates will suit the Mediterranean cuisine, and Gzhel will look great on a white or blue Scandinavian and even classic kitchen. 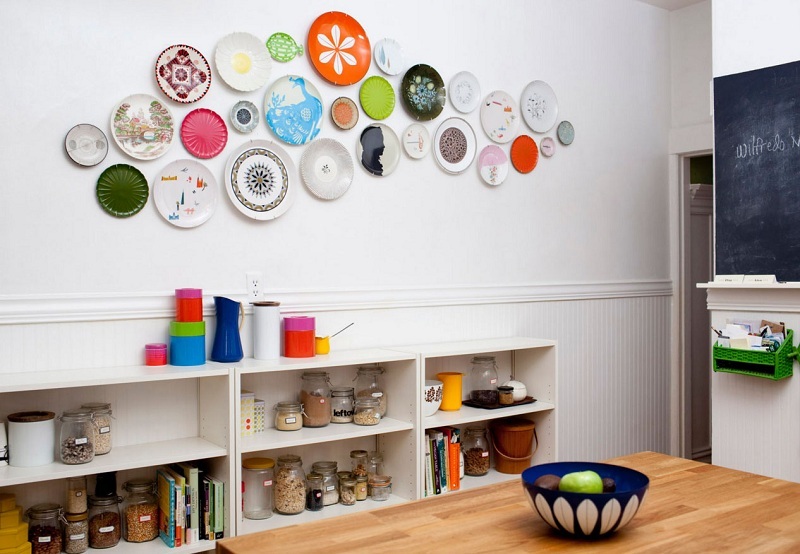 If the dishes with which you want to decorate an empty wall look motley (for example, plates or mugs brought from journeys), they are better placed on a display shelf or on open shelves that will serve as the unifying link of the entire collection. This technique is often used to decorate empty walls in Provencal and Mediterranean interiors. For brass and copper pans, ladles, pots, special fastenings should be made. You may have to hang something like a stand with shelves and hooks on the wall, as in the photo below. If you plan to use utensils for cooking, it should not come into contact with the surface of the wall, be it wallpaper or paint. The exception is ceramic tiles, which are easy to clean and clean. 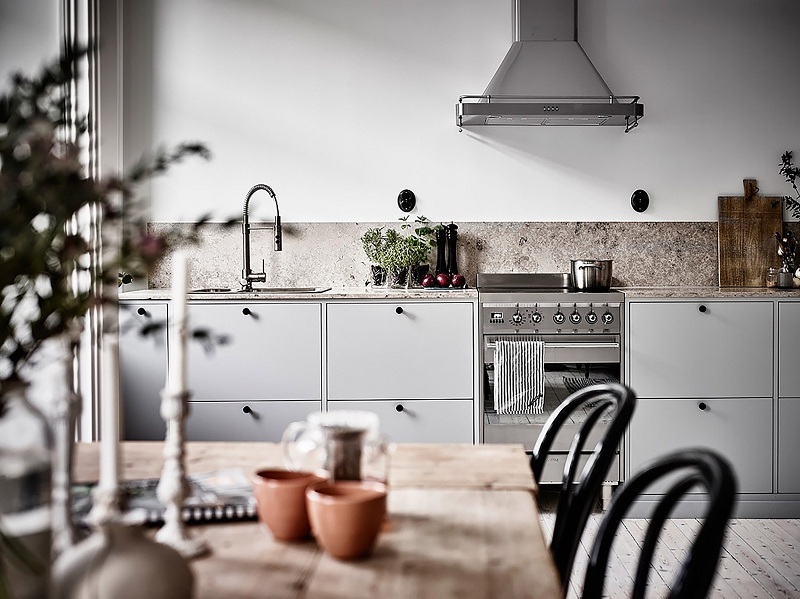 Making part of the kitchen wall using slate paint or self-adhesive film with a slate coating is an excellent solution for most modern kitchens. On such a board, family members can exchange messages, it is convenient to write down recipes, menus, leave wishes to each other, and even just draw, changing the design and design of the kitchen even every day to change the mood. Decorating empty walls with paintings is a way of decor, old as the world, and one of the simplest. In the kitchen, it is customary to hang still life’s, paintings and posters with subjects related to the preparation or absorption of food, utensils, cutlery, foodstuffs, and dishes. Modular pictures and collections of small pictures or photos united by a common theme look great. Uses frames of the same size, shape or color, hang panels and collages with a ladder, wave, circle or star shape, as long as the decor creates a good mood and is in harmony with the purpose and style of the room. A collage of scrap materials, a herbarium on a mat, a picture of wine corks, pasta, shells can be made with your own hands, painted, varnished. On sale, there are original panels with small shelves and hooks, where you can store spices, pot holders, towels, napkins, and other trifles. To occupy the empty wall with a painting is a bold decision, besides, not every kitchen is so appropriate to decorate. Particular care should be used murals; in a small room, many scenes look coarse and pretentious. 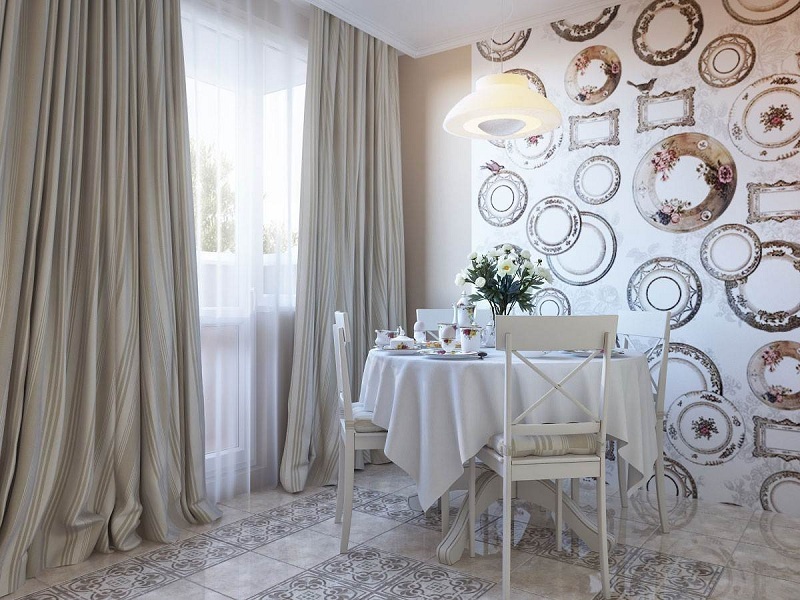 If you like wall paintings, give preference to floral patterns, geometric patterns or repetitive motifs that are in harmony with the kitchen apron, textiles, and the overall style of the room. 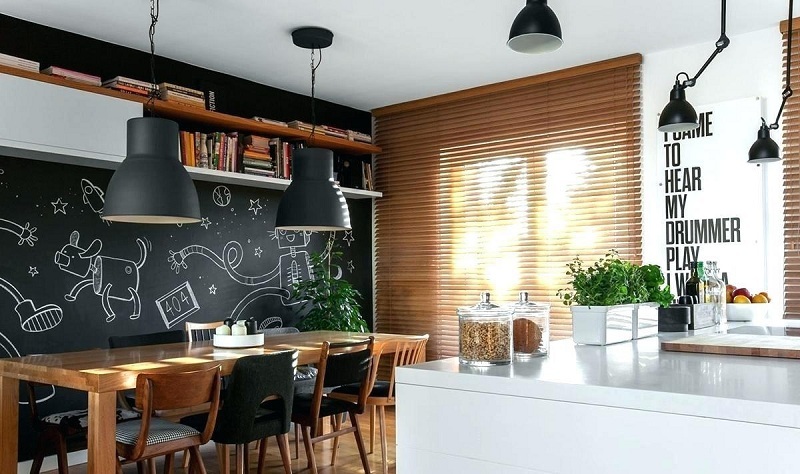 To get started is to experiment with stickers and stickers: they will give the room a zest, and the abundance of plots and drawings will allow you to choose a lot of options for any interior. 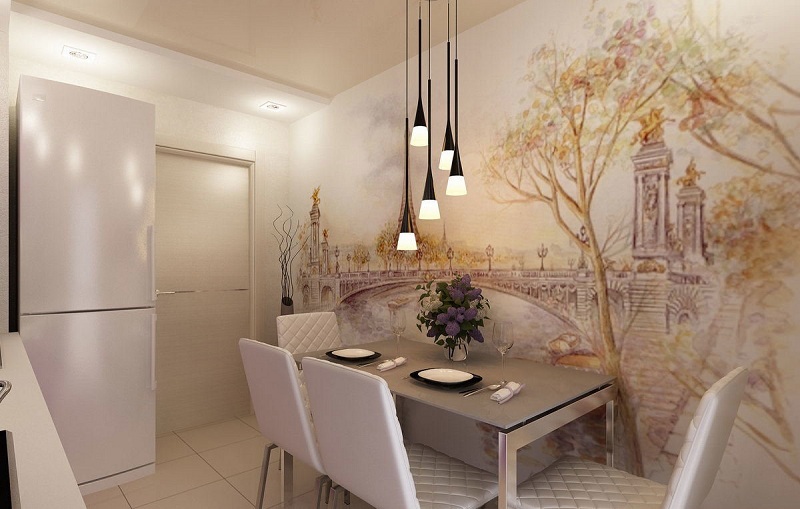 Wall mural as an alternative to art painting – a much more budget option. For high-tech, loft-style, minimalist cuisine, choose black-and-white abstract scenes, city panoramas, trails stretching into the distance. In the kitchen in Art Nouveau style, neoclassicism, Art Deco, floral ornaments, flowering meadows, and woods will look good. Large details are appropriate in spacious kitchens, and on a small wall at the dining table, it is worth making a wallpaper with the illusion of perspective and an unobtrusive plot. Greenery in the kitchen, as in any other room, creates comfort. If you need flowers as a decoration that can be periodically changed, use shelves with vases or transparent flasks filled with freshly cut flowers. Long-term option – pots with flowering plants. 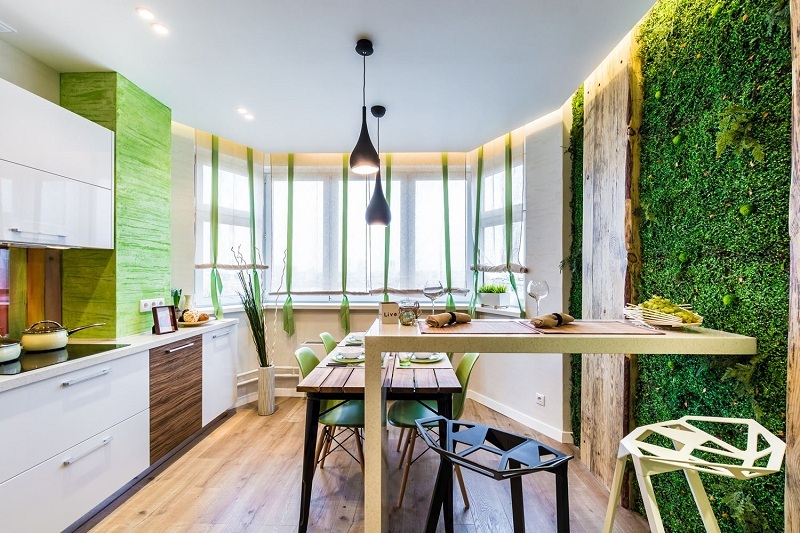 On the Scandinavian, modern, minimalist, eco-cuisine, green photo walls with an irrigation system (as in the photo) will be appropriate, in Provencal, English, classical – it is better to arrange pots with useful herbs in cooking: lettuce, basil, and parsley. And fragrant, and beautiful, and seasonings are always at hand. 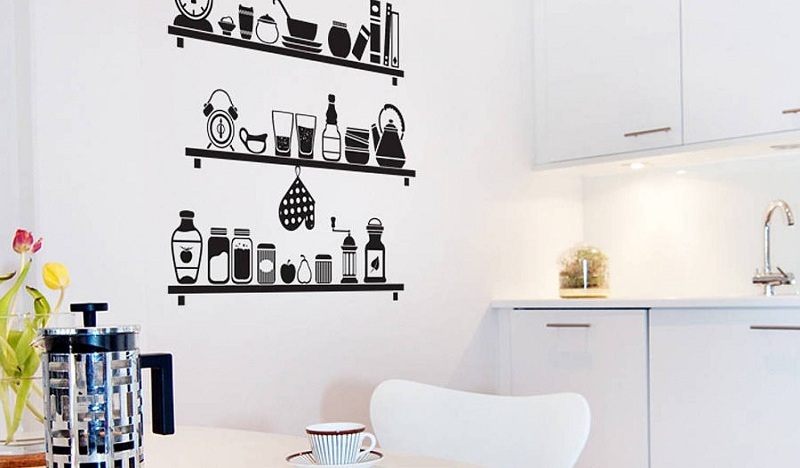 It is not necessary to fill the empty kitchen wall with shelves, utensils, flower pots and paintings. Contrasting (in comparison with other walls of the room) decoration is perfect for the role of decor. 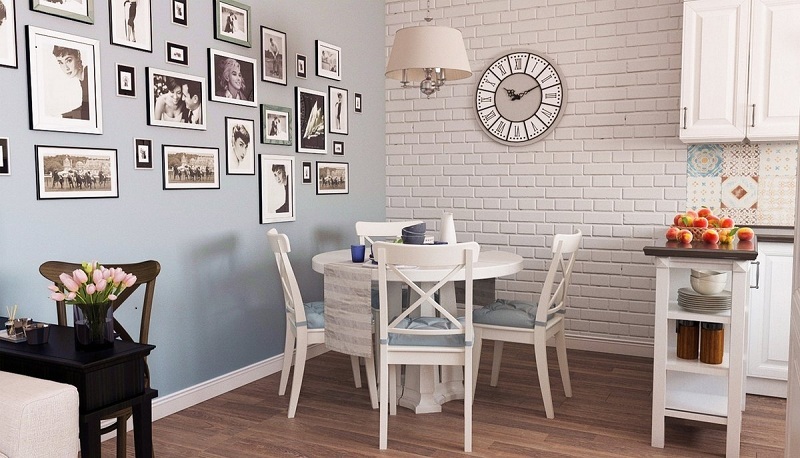 You can simply paint the wall with a darker, brighter, or related shade. 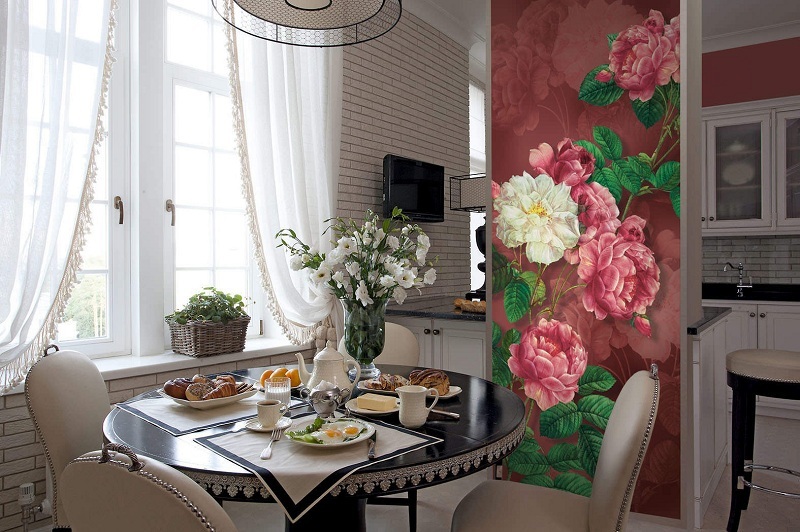 If there is the wallpaper on all the walls of the kitchen, you can paint one or vice versa, use a piece of beautiful wallpaper with a bright ornament for its decoration. For the same purpose, the finishing of a part of a wall with wood, decorative brick or plaster, ceramic tiles, mosaics, and glass panels with a pattern will do. The space for experiments in the design of an empty wall in the kitchen is huge. Finishing a small area will not require large cash outlays, and the result, if you approach the task competently and with taste, will exceed your best expectations!